I lost my 8GB high-speed eMMC. So I'm looking for replacement. 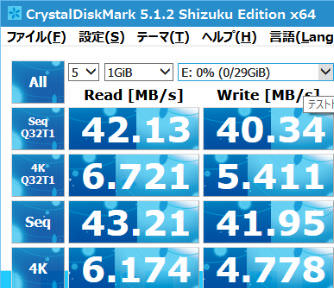 Please tell me what is the fastest SD-card I can buy for U3, because eMMC s are too expensive for me right now. I would like rather a maximum speed high capacity SD card. So, what SD-card should I buy? Genuine Samsung EVO+ 16GB or 32GB should be a good alternative. Thank you for your response, odroid. What maximum SD-card capacity is supported by U3 Community Edition? We tested 128GB and worked. I think 200GB and 256GB should work too. But we didn't try yet. Dear odroid. Thank you for your answer. You have probably the deepest knowledge on the forum, I think in hardware-part too. So, I'm trying to figure out the best way possible - what is the ultimate best option in my case. First of all I think that my old USB 2.0 noname card reader doesn't support high speed SD cards. As we can see on both card maximum sequential read speed is exactly the same, but cards are in way different classes - Class 4 vs Class 10 UHS-I. However, the rest of measurements has no obvious limits. 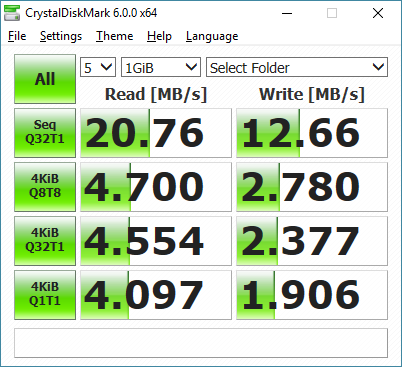 As far as I understand - the most important thing for good performance as main disk in ODROID is random read and write speed of small pieces of data. The sequential speed is not as much important, because while booting process and usual OS using bottleneck is mainly in input/output disk operations. Please correct me if I'm wrong with that. My UHS-I is almost 3 times faster in small data read/write speed, than older Kingston Class 4. 1. Is it really my UHS-I can give me a good speed for comfort using my Odroid U3? 2. 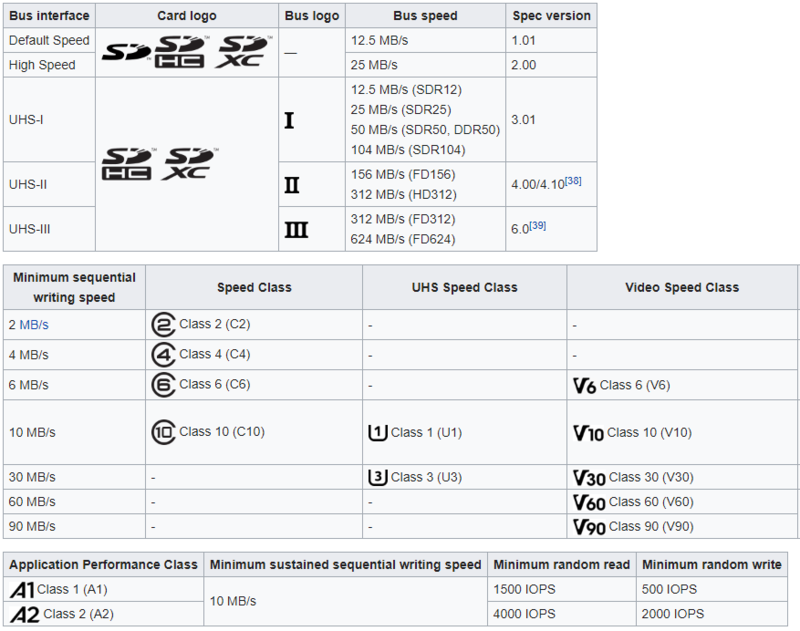 There are a coupe of new types of faster microSD cards: UHS-I u3 (V30 Class 30), UHS-I u3 (V60 Class 60), UHS-I u3 (V90 Class 90) - that cards are mainly for Video recording, so they are fast for sequential write speed. Other new type of SD cards - A1 Class 1 and A2 Class 2. These two types have IOPS standard limits. So, are they better in random read/write operations, and are they better for Odroid U3 usage then for example regular Samsung EVO+ card? 3. Does Odroid U3 have support of A1/A2 type of SDcards? 4. Does Odroid U3 have support of UHS U1 and UHS U3 class of SD cards? 5. 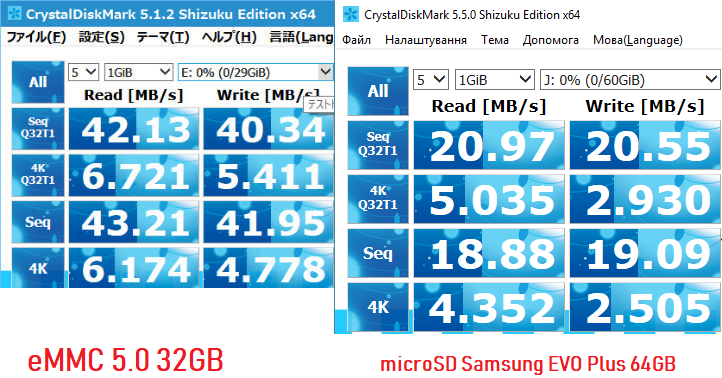 How close are UHS U1 and UHS U3 SD cards to eMMC 5.0 in terms of boot speed for Odroid U3? 6. Can UHS U3 SD card give me significant performance boost compared to UHS U1 card? Exynos-4412 SoC doesn't support UHS mode while newer SoCs in XU4/C2 supports it. So ODROID-U3 SD-interface maximum clock speed is around 50Mhz which limits the data rate at 20~25MB/sec. I think normal Class-10 U1 should be okay since random IO speed normally faster with UHS-1 U1 cards. Therefore, A1/A2/U3 are over-spec for your ODROID-U3. eMMC 4.4 controller in Exynos-4412 can handle up to 70MB/sec. So we recommended the eMMC module even it is more expensive. What is the current booting time with your SanDisk Ultra 64GB U1? Android has a couple of thousands small libraries are loading in the boot process, slow media affects the boot time a lot. And the boot time (second boot) takes for about 50 seconds to get into Kodi environment. Overall it takes 70-80 seconds to see "import roms" menu in Kodi. Overall, this system feels slower (less responsive) than on my old eMMC module, but it's pretty much acceptable. I've tried 8GB Kingston SD card and Android KitKat 4.4.4 - it's unusable. Even simplest operations with this card are as slow as ZX Spectrum that runs Windows 10 . It's impossible to use. Now I have to try emulators in ODROID GameStation Turbo. I think top sequential speed is not as important as random files access speed. 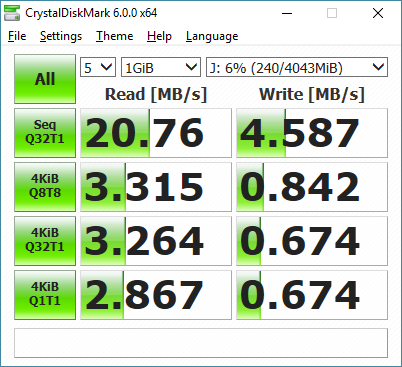 My opinion based on that Kingston SD card I've used feels 50 (or even more) times slower in therms of responsiveness than my SanDisk Ultra 64GB U1, but in CrystalBenchmark speed the difference is approx. 3 times. Maybe I'm wrong, please if so correct my thoughts. 4K random access speed is very important to improve the responsiveness. @Odroid can the new eMMC module work on Odroid U3. As we can see, the difference is not huge. We're getting not a big performance loss. Please, bare in mind that my USB 2.0 card reader limits sequential r/w speed at ~21MB/s. moon.linux wrote: @Odroid can the new eMMC module work on Odroid U3. Nope. new Orange eMMC modules are not compatible with U2/U3. @odroid. Thanks you for your input.